Conventional roof drainage generally comprises of open roof drains connected to vertical downpipes that are designed to operate at atmospheric pressure with a greater volume of air in the system than water. 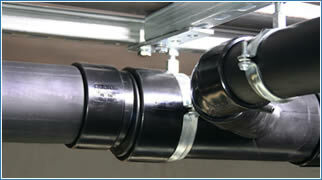 It is necessary to slope the pipework away from the horizontal to induce the flow of water to the drains. The size of the drains and the allowable depth of the water above them usually determines the discharge capacity of the system. In a siphonic roof drainage system, the drains benefit from the addition of an air baffle to prevent the entry of air into the system and by ensuring that the pipework is assembled to specific dimensions, air can be totally removed from the system thus filling the system entirely with water. The calculation of the exact pipe dimensions requires a full understanding of the forces acting within the system, the type of material used for the construction, the maximum storm conditions, the roof area to be drained and the height of the building. The calculations are complex and can only be solved by iterative sequences – specialist software is essential!